One of the consequences of writing this blog over the last nine years or so is that I get invited to all sorts of events. Some of them are things in Australia and America but being based in Scotland means I can’t go. And then sometimes, it’s something that’s happening just a few blocks away from where I live. Like on Friday night (August 7) when the Edinburgh International Festival launched with an amazing double bill of Beethoven and John Adams at the Usher Hall. I was privileged to be at the concert inside the Usher Hall of Beethoven’s Choral Fantasia in C Minor and John Adams’ Harmonium. Performed by the Royal Scottish National Orchestra in conjunction with the Edinburgh Festival Chorus it was awesome. And then outside we were treated to Harmonium again with projections by 59 Productions. Some kind person has recorded the entire event on their mobile – and it was great to see so many people (must have been 10,000) taking over the normally busy Lothian Road to watch and listen to awesome music. It’s always pained me when people see something like classical music as being elitist and difficult to get into. It doesn’t have to be. The Maccabees have spoken about this, their fourth album, as being a difficult one to make. The word ‘traumatic’ has been banded about. This seems to be as much to do with the fast-changing world around the five-piece in their base of Elephant and Castle in South London as well as the pressure of following up their most commercially successful album yet, 2012’s Mercury-nominated Given To The Wild. The album opens with the fantastic rush of the title track. Strangely, it’s melodically reminiscent of Beck’s ‘The New Pollution’ (without actually sounding much like it). It’s an opener that grabs your attention and sets you up for what newcomers might assume is a mix of the fun of Supergrass meeting the energy of The Cribs. …only, the album doesn’t actually pan out like that. The next couple of tracks are melancholic, which is fine in itself, but it’s a dirge-like melancholy like you would find on a run of the mill indie-by-numbers record. Whilst it strives for authenticity, it’s not anything new, and despite listening to the album several times, I found my attention wondering at this point, frankly. 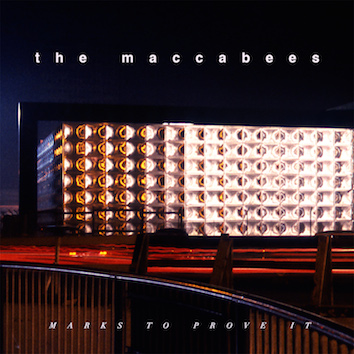 On the fourth track, ‘Spit It Out’m the Maccabees start to rediscover themselves, as the track slowly builds and builds like it’s getting itself on track. The second half of the album is much stronger than the first, holding your attention far better, and it’s here that the albums two strongest tracks lie. ‘River Song’ with its refrain of ‘You’re not getting any younger’ (oh, don’t I know it) is hauntingly beautiful. And the album comes to a close with the gorgeous ‘Dawn Chorus.’ This can be alikened to Syd Barrett discovering brass and Americana, and the only fault I can find with it is that it’s over far too quickly. Some alright bits, some excellent songs, and some bits you’ll find that you can live without.